Ready to sign up? Before you can hit the pavement, you need to make sure you have the right gear to rock the walk! Can you look totally fly while giving back? But of course! Let’s take a look at the essential fundraiser fashion checklist. Footwear: Your BFF on Walk day is definitely a great pair of sneakers. While you’re supporting the cause, they’ll be supporting your feet. You’ll need sneaks with good arch support, because nobody looks cute while limping through the city. Your local Boomerangs store has stylish athletic footwear from a ton of top tier brands, without the steep price tag. 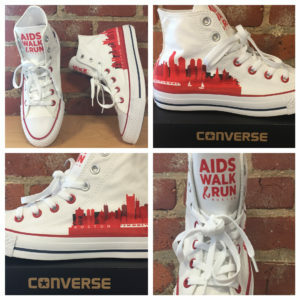 This year, AIDS Walk and Run Boston is hooking up its participants with some truly amazing kicks – custom designed, extremely limited edition Converse! When you raise $1000 for the Walk, these wicked sweet sneakers can be yours to show off around town! Tees: The best part of warm weather? All the fun T-shirts you get to finally rock! 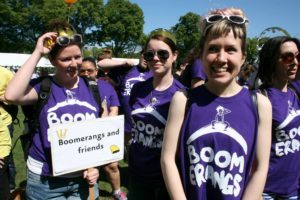 Boomerangs has a whole rainbow of tees just waiting for you to show off your personality. Or, grab a plain tee and decorate it with your Walk team name and some inspirational words for your fellow fundraisers! Want a souvenir from this year’s Walk & Run that you can wear for years to come? When you raise $500 for AIDS Walk and Run Boston, you’ll receive this gorgeous 2017 T-shirt to let the world know what a hero you are! Totes: You’ll have a lot of gear to carry on Walk day: water bottles (hydration is essential! ), sunblock, a hoodie in case it gets cool, and lots of free snacks from the AIDS Walk and Run Boston Wellness Festival at the finish line. Need a bag for that swag? You totes do! Stop on by your local Boomerangs and peruse our bag selection today. 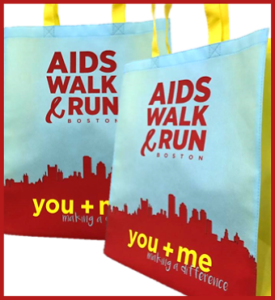 Speaking of satchels, did you know that when you raise $100 for the Walk, you get your very own official AIDS Walk and Run Boston tote? You’ve really got this fundraising thing in the bag! Now that you’re dressed to impress, we hope you’ll help make this AIDS Walk and Run Boston a huge success! See you on June 4!